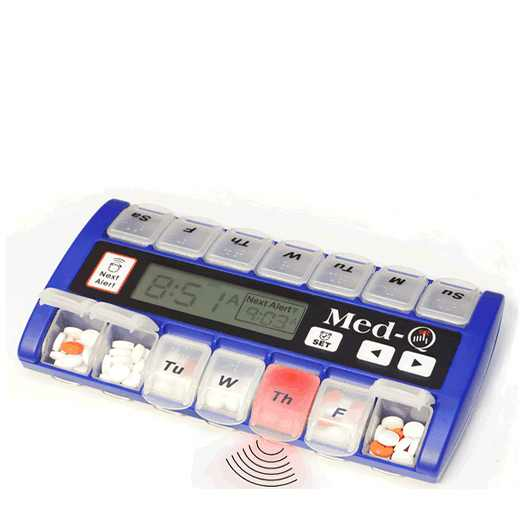 SpecialNote: If you need more than 2 alarms per day - A single Med-Q reminder allows you 2 alarm (medication times per day) but by purchasing the combo kit which includes 2 Med-Q Pill Reminders (one of each color), this will allow you to have 4 seperate alarm/medication times per day. If you are needing more than 2 alarm times per day then choose the combo kit in the drop down menu above where you choose the color. This will also save you $10 on the 2nd unit! 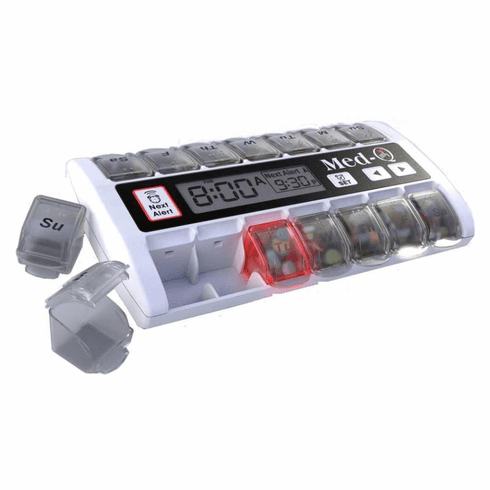 We had several customer call requesting a way to set more than 2 medication times per day and this is the simplest solution to that problem. See the images/video below for a complete explanation on how this would work. 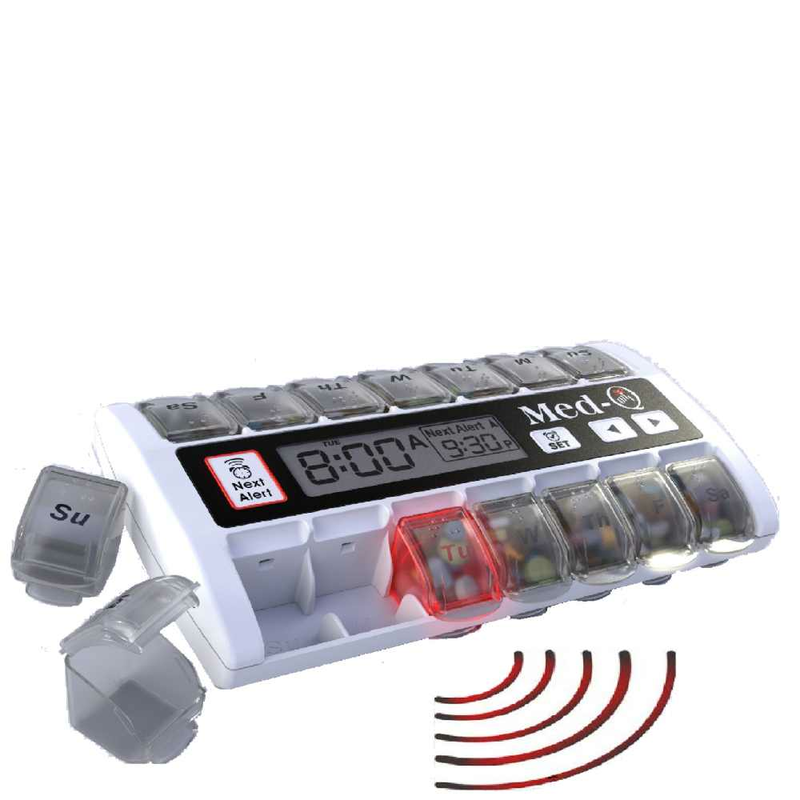 The Med-Q Smart Pill Reminder Box can be used to remind you of 14 alarm events or medication times. Users that take pills twice a day (morning & evening) can load the pillbox on one side for the morning dose and the other side of the pillbox for the evening dose and not have to worry about it again for 1 week (7 days). But what if I take pills at 3 or even 4 different times per day? 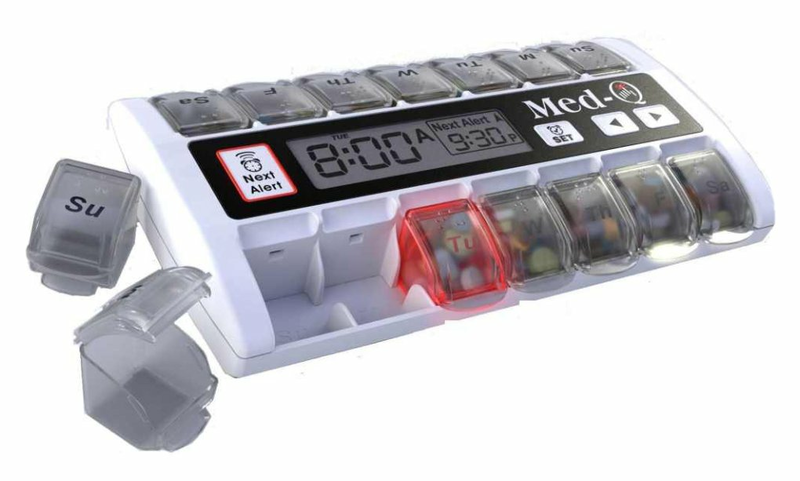 Simple, we sell a COMBO KIT containing one of each color, by purchasing a 2nd Med-Q Smart Pill Reminder box you can increase from 14 alarm events to 28 different alarms. The Med-Q comes in 2 different color choices (blue & white). You can order one of each color combo in the drop down menu above. On the blue Med-Q you load up one side with a 10am dose, the 2nd side with a 2pm dose, then on the white Med-Q you can load one side up with a 6pm dose and the 2nd side with a 10pm dose. (Times are just an example to demonstrate, you can set any time you want of course).